The meat industry needs to return to its roots of pasture-fed cattle, says Graham Harvey. In this week's Green Room, he argues that traditional farming methods can deliver more sustainable and healthier food as people become more aware of what ends up on their plates. The best beef I ever tasted came from a small farm just three miles from where I live in Somerset, England. I'd heard from a foodie friend that the farmer sometimes took a beast back to sell in freezer packs direct from the farm. When I called to collect my meat I was struck by how old-fashioned the farm looked. For a start, the pastures were full of clovers and wild flowers, a rare sight in an age of chemically-fertilised monocultures of most beef farms. 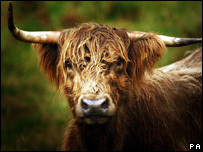 The pastures were grazed; not by one of the big, continental breeds so popular with modern farmers, but by traditional Red Ruby Devon cattle, once the universal breed on Exmoor. This was the way beef had been produced for thousands of years in the UK. This supplier had stuck with this way of farming even though his neighbours, one-by-one, switched to the big cattle and the intensive methods so favoured by the supermarkets and giant abattoirs. 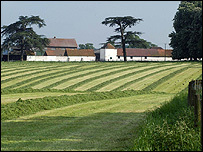 No doubt they had a quiet chuckle at this quaint style of farming as they looked over the hedge. But they don't laugh any more. As scientists continually uncover more health benefits from this natural, pasture-fed beef, there's a growing queue of customers waiting to buy it. Research has shown that, in contrast to most supermarket meat, this beef contains more anti-oxidants including vitamin E, more iron and other minerals, more omega-3 fatty acids and more of the powerful anti-cancer compound known as conjugated linoleic acid. As a result, it doesn't simply supply high-quality protein and other nutrients; It can actually help protect the body against heart disease, cancer and a host of other diseases. The "commodity beef" that fills the supermarket chill cabinets fails to provide these health benefits. Yet this is the kind of beef western governments continue to support through their agricultural policies. On any rational grounds, pasture-fed beef ought to be the norm in countries like Britain that have the climate to grow good grass. As well as producing healthy meat, pasture-based production systems require no chemical fertilisers, especially when they contain nitrogen-fixing clovers. The great beef-raising countries of the world - South America, central and eastern Europe, and on the Great Plains of the US - all based their production on semi-natural grasslands. It is a system of food production that is sustainable, efficient in resource use and good for the environment. Semi-natural grassland absorbs carbon dioxide from the atmosphere and builds up soil carbon reserves. Higher levels of organic matter boost the uptake of valuable trace elements by plant roots, so the whole system made up a virtuous circle from which healthy food and a healthy planet were the chief products. It has been destroyed by political measures to promote worldwide grain production. For more than 30 years, governments in the US and the EU have poured subsidies into the production of wheat and other grains. They have maintained a permanent global grain surplus that has made the production of healthy, grass-fed beef uneconomic. 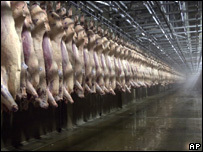 Traditional beef producers are unable to compete with the inferior meat produced by animals confined in sheds and feedlots and fed on the subsidised grain. This is an unnatural food for ruminants. The meat it produces is the kind that's more likely to lead to heart attacks and cancer. European and American taxpayers have unwittingly degraded a staple food. Chief beneficiaries of the change have been the agri-business corporations who supply chemical fertilisers, pharmaceuticals and a host of other inputs needed to keep the current system going. Pasture-based production with its healthy animals and fertile soils required none of these things. The natural grassland of the US prairie states supported 50 million bison. Without inputs they would have supported a similar number of cattle. Today those same states are mainly under corn and soya crops, which require huge inputs of chemical fertiliser, pesticide, irrigation and government subsidy to keep on producing. Most of the crops are fed to livestock from which the food products are far less healthy than the original grass-fed version. This damaging form of food production is backed by intensive lobbying from agri-business companies and large farmers. In Britain, the influential National Farmers' Union - whose president is a commodity cereal grower - pledges support for family farms. Yet the union has for decades fought to keep the grain subsidies that destroyed pasture-based livestock production, the mainstay of the family farm. With western industrial countries suffering an epidemic of degenerative diseases, there's an urgent need to return to the healthier foods from animals raised on pasture. At the same time, it's important to reduce the environmental impact of nitrate fertilisers which are major contributors of greenhouse gases. Switching livestock production from grain to pasture-based would help achieve both objectives. Ironically, US and EU backing for biofuels may lead to a global renewal of pasture farming. Government aid for bioethanol and biodiesel production from temperate crops - essentially a new form of subsidy for arable farming - has led to a doubling in grain prices. For the first time in decades there are no surpluses of cheap grain for intensive animal production. The traditional production of meat and dairy foods from grassland begins to look viable again. Western consumers can speed to switch to healthier foods by giving pasture-fed foods a higher priority. In doing so they'll protect not only their own health, but the long-term health of the planet. Do you agree with Graham Harvey? Do intensive farming methods deliver poorer meat products than traditional methods? Or do we need to accept that methods have to change in order to feed an ever increasing number of mouths in the 21 Century? Plants take up about 30 different elements as well as known and unknown organic chemicals from the soil. Man usually only returns 3 elements, nitrogen, phosphorus and potassium and then worries why the whole system is unhealthy. North Africa is a dessert because the fertility, transported as grain, was washed down the sewers of Rome. Are Europe and other intensively farmed areas heading in the same direction? If technologically advanced arrogant mankind does not relearn how to recycle ALL the nutrients and organic material, a huge catastrophy awaits. I would question whether grass fed beef is better for the environment. How is 15000 litres of fresh water per kilogram of beef an environmental benefit? What about the extensive use of non-renewable chemical fertilisers that goes into producing grass fed beef and dairy? The greenhouse gas emissions per one kilogram of beef is 50 times more than flying a can of beans from the UK to Canada. If there was a health advantage in eating beef then it is clearly not a win in terms of longevity. The longest lifespan by country in the world is ~83 years and the country is Andorra. Californian Seventh Day Adventists that are vegetarians have an average life span of ~84.5 years. UK is ranked ~41 in the world. It seems the justification to raise and kill animals for human consumption is purely palate driven nothing to do with health or the environment. Only eat a small amount of meat, try proper chicken from a farmers market, much smaller in size and expensive, against a supermarket one ??? you will taste, why good quality cost more!!!!! People tend to forget that humans are not carnivores but omnivores, meaning that we are not meant to eat meat every single day. In countries where a lot more fish and fruit/vegt is eaten, people tend to be a lot healthier than the average person living in the UK. I'd rather eat good quality meat just twice a week - from animals that have been reared in natural surroundings - than poor quality meat seven days a week. I can't believe people are saying we are running out of land - that's just media produced rubbish. In the UK for example, there are ~60m People, and 60m acres of land. That's an acre per person, which is plenty of room. I completely agree with Mr Harvey. People complain about paying more for better quality meat, but don't think twice about buying cigarettes, alcohol,brand items, etc. Isn't one's health and the health of the planet more important? All our food is organic and we seldom fall ill. And animals should eat what they're supposed to eat, not what we dictate they should. We would be ill if we ate what we shouldn't. This article has generated some intelligent question from around the world It is worthy of note that the abillity to produce food for the masses without chemicals has been proven with field testing over the last few decades.It is coined "Permaculture" The founder of this principle Was Bill Mollison who simply copied nature. He has demonstrated clearly and conclusivly that an acre of land growing multiple species will out perform broad acre mono culture. Great article! If Americans produced and ate beef produced this way, in addition to drinking more green tea, there would be many fewer instances of cancer. I think a compromise has to me made, feeding the animals similar feed is the key to obtaining the results we want to see, what the intensive farmers seem to miss. 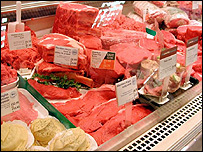 We have an ever growing population which demands these meats; to switch to what is mentioned is ideal, but unpracticle. However, why cant a compromise be met? Feeding them similar intake, allowing certain excercise, whilst reducing the space they live. Antibiotics and steroids are not pumped into British meat, our welfare standards are far higher than the rest of the world. And Mr Henry is mistaken, there are no grain surpluses, and there are very unlikely to be any again. We as a country will have to look to our farmers to survive, China will be able to pay more for its food as its a manfacturing nation. Thankyou the unenlightened generation for giving us climate change, expensive fuel, no jobs, expensive food and a polluted planet. I buy my beef from a local farm.You can see the cows,they all look happy and the've got plenty of grazing land.The meat is unrecognisable from supermarket meat,especially the mince,it's delicious and the price is cheaper too.As for the environment,it doesn't have to travel far. He is wanting some kind of eutopia that never existed. The UK climate is not favourable to outwintering large animals. Indeed it is cruel to deprive the animals of shelter and dry bedding while the mud and mess produced by animals living and feeding outdoors for five months of the average UK winter is an unacceptable environmental disaster where it occurs. For the most part such mismanagement is practiced by inadequate idiots or the financially desperate. Free range beef may be better from an environmental and animal welfare perspective compared to intensive farming of animals but I know of no study saying the nutrition is better. Mind you who wants to get nutrition from a bad cholesterol source when there are so many cholesterol free alternative foods (and they don't produce green house gases). My family has been in the large scale cattle ranching business for generations and have always practiced a free range approach to our beef production. No steroids, hormones, or any other kind of growth enhancements. We are finally starting to see a turn in the market towards conscious buyers wanting a better, healthier product. Articles like this really help get the word out. Thank you. Well said Henry, I thought I was the only one who'd realised, if we have a smaller population we will need less food and produce less waste, whether it be greenhouse gases or just rubbish. Contraception isn't a difficult concept to understand afterall. We all live longer now so working a few more years should counter the effect of an ageing poulation. Farmers who raise cows, pigs and chickens in this way sometimes call themselves grass farmers. Books like the omnivore's delima have highlighted the resurgance of this old way...I eat "pasturized" eggs and chickens (that are usually raised in conjunction with cattle, and eat the seeds, insects etc that the cattle kick up) and I can say they taste soooo much more flavorful and rich, and are better for you too. It is great to see that awareness of these issues is increasing. May I suggest that anyone who wishes to further their knowledge of alternative farming techniques, should search the web for references to "permaculture", and "urban agriculture". Currently regarded as fringe activities; I believe they will become mainstream within a decade. Pasture meat is unhealthy too. Someone had to die for it. Why is that simple fact not arriving in peoples psychology? It really doesn't matter how much wie try to beautify the consumption of animal products, you can't get rid of the fact that it is avoidable to kill and exploit other animals. The giant move of all humans to embrace at least the vegan diet is a task of our days. Ultimately, the food solutions are not about food....they are about reducing world human population, so that there is enough food for people, without destroying the forests that protect our planet's overall environment. If we had smaller world human populations, there would be plenty of room for raising healthy food animals, as well as healthy food crops. Until the issue of human over-population is addressed, one can only wonder if the other issues can even be dealt with, in any meaningful and effective way. Biofuels are going to exacerbate the problem. Well, yes. I agree completely. There's also nothing sadder than countryside without farm animals. In Bavaria, where I live, the livestock is kept inside, all year round and the arable land given over to growing feed maize in huge monoculture fields. Awful. One of the sights I look forward to most on visiting the UK is green pastures full of sheep and cows. For once I sort of agree. Leaving aside the spurious stuff about vitamins (I buy vitamin/mineral tablets for 99p for 60) it sounds like a good idea to feed cows on grass. Let the cows wander the marginal land and use the good land to grow things which can be turned into biofuel for my car. Is any of what Mr. Harvey says true? He offers no documentation to support any of his assertions. Should we just take his word for all this. Even if it is all true, how much extensive farming is their room for and how much are people able and willing to pay for beef. His scheme would certainly increase the number of vegetarians, especially among the less than wealthy. This is truly a disastrous idea. Putting cattle on pastures is extremely inefficient and leads to increased greenhouse gas emissions, soil compaction, erosion and many other ills. It also requires vastly more land, a precious resource. We need this land resource to grow biomass crops for energy, one of our only realistic shots at fighting climate change (no other renewable energy source can yield carbon-negative bioenergy, that is biomass coupled to carbon capture and storage resulting in huge negative emissions; all other renewables are merely carbon neutral). So no, this must be one of the worst ideas imaginable in our present condition. It is the least efficient allocation of natural resources. I have been studying nutrition, specifically the effects of meat and its productional practices. I have been a vegetarian and a vegan. Now I consume small amounts of high quality meats. I would recommend only 8oz. of meat per week, for the serious meat eater. Therefore less consumption for everyone else. All edible fish are due to be extinct. The best options for protein are organic nuts, seaweed, free-range organic eggs, organic free-range dairy, and beans. Tofu is difficult to digest and is of low quality. Lets not forget it is a processed food. Tofu propaganda comes from its cheap simple mass-production costs and profitability. Until these things (like this article) are taught as an alternative in most of the secondary schools worldwide, the awareness of enough numbers of the global population will not be sufficent to overcome the political influence of the multinational chemical/agribusiness corporations. This report doesn't surprise me. Some years ago I read that the EU governments' reckoning of food nutritional value was based on "old-style" foods (eg pasture-raised beef). Modern, supermarket foodstuffs have less nutritional value and are lower in essential minerals, etc than their (more organic?) predecessors. So, when they say " eat 5 portions of fruit or veh a day", it's not very useful unless it's grown properly. Eat sheep-meat - it's difficult to raise sheep intensively! I would give always priority to traditional methods of grpwing vegetables,cereals and pasture-fed food. It is very important to go back to nature and use nature resorces, and i am sure that we will be healthier. We Humans are so stupid with all the latest scientific research stating that meat production is the number one factor causing global warming one of them being UN report (Livestock's Long Shadow) and the resent NASA report that if we do not all totally change our selfish consumption lifestles by the end of 2012 this planet because of the ice in the polar caps melting and a toxic gases being released ( hydrogen sulphide) into the atmosphere we will all be gassed.WAKE UP HUMANS GO VEGETARIAN NOW! BE GREEN!NOW!! ITS URGENT!! !TIME IS RUNNING OUT! I always try to eat new Zealand lamb for meat and new Zealand diary products, as they eat only pasture all year round and are free-range. But then there's the carbon miles issue. You just can't win. If we hadn't put houses on our flood meadows there would be more room for outdoor reared animals. I'm sure Graham is right that intensivly reared animals produced inferior meat because the variety and complexity of grasses in a meadow will beat any chemical industry's alternatives. The use of pasture for raising cattle predominates in this area, though most ranchers sell cattle to feed lots also. The low prices for grains have shifted land use from pasture to planted pines. A shift to pasture based feeds would help farmers in many ways here as the trees provide nothing in terms of annual income. I would welcome more pasture based meat. I could not agree more with Mike from Manchester. We have got to the point where people think it is their right to eat meat every day with every meal, and when that meat is cheap, intensively reared, cruel to the animals, and full of pesticides and hormones, you have to wonder who benefits. I only buy good quality meat, but just a bit less of it!! i think it is about time the farming industry went back to natural methods and stopped filling our food with additives such as steroids, antibiotics, and other chemicals. in other words i agree whole heartedly with Graham Harvey. I am very fond of my meat - yes. But that entails that I would like top-quality meat, and not at bargain-basement prices; that is simply unrealistic. I think traditional pasturing and other traditional farming techniques need to be massively supported. We would all benefit, even the vegetarians amongst us, because the environment would benefit. Go figure! Makes sense, here in Oz they were - maybe still are- using processed chicken litter in feed lots for beef production! A good article overall, just a few minor beefs (sorry...). Firstly, if you want to encourage conversion of feed energy into beef, the feedlot system is far more efficient. So, in a market that demands more, cheaper food, production of staple (as opposed to niche) meat requires these methods if it is to be economic. Blame the consumers who will only buy ultra-cheap meat, not the farmers who try to supply what people want! It does tend to be true that extensively reared animals are often healthier than their intensively reared counterparts, but it's not as clear cut as you might think - partly because there are a lot of diseases that are ONLY found in extensive systems (fog fever, for example); and partly because of the effects of exposure to the elements on the livestock, either directly or indirectly (hypothermia and grass staggers, for example). I agree, however, that in order to feed the population predicted by 2050 we need more extensive animal rearing, on the marginal land so the good arable land can grow grain for US to eat! But why eat beef at all? It's unnecessary and very polluting, even when pasture-fed. While raising cattle on food crops is obviously bad for the environment, it is for the sake of cattle on the open range that untold millions of wild animals (prairie dogs, wolves, coyotes, bears, cougars, bison, eagles, etc) are killed. The federal US government kills 60,000+ coyotes every year with taxpayers dollars to keep cow and sheep "producers" happy. Look it up: there are a million horror stories that largely disappear under the radar, and eating pasture-fed beef won't stop them. If anything else did as much harm to the natural world as meat does, it would have been boycotted long ago. I am an omnivore and I only buy good quality meat from either the farmer's markets or a good butcher. All of this recent surge in consumer awarness over meat is definitely a good thing. But what no one is really stressing is that we don't have to eat meat. Meat used to be an ocassional luxury, now people treat it as a regular part of their diet. If you can't afford organic or free range then don't eat meat at all until you've saved up a little in order to buy some excellent quality meat. I live on a tiny budget but still treat myself to the odd bit of top notch meat. We need to eat less, higher quality meat. It's better for us, better for our farmers and better for the evironment. I do agree with what as been said here but am surprised that there was no mention of the fact that. Lot feed beef are the one thing that as more to do with the western people getting over wieght and obeast. just take a good look at how the fast food chains have coarsed the addatives to be used in Lot feeding. Now we have the chemical companies selling genetily altered grain seeds. We know that there as never been a chemical made by man that when taken in quontaties will Poison people. How long will it take until some people realise that you alter nature and you end with troubles. It as taken 0ver 30 years to find out about the mess the farms are in and it was coarsed by MULTINATIONAL GREED. We have known fore the last 10years that we have changed the cliemate so why do we not get to gether and put a stop to the Multoinationals greeds. THey are not working to better man kind but are just building their own bank balances. One line in Mr.Harvey's article is worth noting where it mentions increasing queues of expectant consumers at the old style beef farm. It leads us to the core dilemma facing us: Though back-to-nature techniques look so appealing, can they measure up to the task of feeding the significantly higher number of consumers available today (compared to say a 100 years ago)? Feed lots in the US breed E-coli in the animals and the waste contaminates water supplies with nitrates. The cattle need antiboitcs and are given hormones. The meat is inferior. I am so glad we are all waking up to this. In the states, we should return some of the Great Plains to the buffalo, which produces wonderful great meat. Good article! I would add a couple of points. I don't think so called 'chemical fertilisers' should be automatically disregarded. They can be a very important part of a sustainable pasture system, particularly one based on grass-legume mixes. Legumes often respond to P and S, particularly in very old soil like we have in Australia. Another point is that the points in the article also pertain to the dairy industry, which in many countries is grain based rather than pasture based.